"If you want to know what's inside my head, come to Hot Licks and hear me sing." Bubblegum Crisis continues with the story of Tokyo in the year 2040, following a horrendous earthquake. The futuristic city has been rebuilt by mysterious robot workers known as "boomers," that appeared following the disaster. Genom Corporation is the driving force behind the development and spread of boomer technology. However, many people are opposed to using robot slaves to do the manual labor of civilization. To further compound the problem, some of the boomers go rogue and act in a violent and dangerously mindless way. The A.D. Police, whose job is to deal with the maddened robots, are most often unsuccessful. 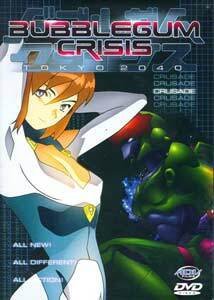 An independent group of crusading vigilantes called "The Knight Sabers," recently accepting a new member in Linna Yamazaki (Kelly Manison, Rio Natsuki), continues using their own technologically advanced armored combat suits to battle these destructive robots where the A.D. Police fail.Episode five, Rough and Ready, opens hot with a factory boomer gone rogue and the A.D. Police deployed to stop it. The boomer seems to have acquired the ability to fuse with the machinery around it and increase its power. The Knight Sabers deploy as a team of three for the first time. Elements of the situation lend themselves to the idea that there are forces from outside that are contributing to the danger of the rogue boomer problem. The A.D. Police send in their own troops with combat armor called "K-suits" that are much less advanced than the combat "hard suits" of the Knight Sabers.The A.D. Police attack the boomer with a frontal assault bot fully realizing its power. Meanwhile some of details of the mystery of boomers and their history begin to emerge as The Knight Sabers prepare to battle the boomer that is giving the A.D. Police so much trouble. We begin to see friction grow between the team members as Priss (Yu Asakawa, Christine M. Auten) shows little patience with the antics of Nene (Kiroku Konishi, Hilary Haag) and the inexperience of Linna. Sylia is troubled by her own memories of how she grew up to become the power behind the vigilante group.This episode does not stand alone as it definitely requires information from the previous shows for the viewer to understand what is going on, and much time is spent developing what is to come in future episodes. However, the battle between the Knight Sabers and this surprisingly powerful boomer is interesting and suspenseful.Get it On is the title of Episode Six and it picks up right where the previous show ended. The whole battle was broadcast live on television as the A.D. Police tried to set up the Knight Sabers to discredit and capture them. Priss gets a chance to work off some of her angst in making the A.D. Police pay for their treachery, but her suit is damaged by a shot in the back. Things look grim for the team until something surprising happens.Later, as the members of the Knight Sabers struggle with their dual lives, a guest arrives to visit Sylia who turns out to be her long lost younger brother, Maki (Tonomori Miyata,Spike Spencer). The youngster feels an affinity for Nigel (John Gremillion, Ken Yamaguchi), the technical wizard of the hard suits, and soon longs to be a contributing member of the team. He looks around Sylia's house for a needed part requested by Nigel and accidentally stumbles into the Knight Saber dressing room and gets an eyeful. Although some anime silliness does ensue, it is not enough to save this episode, which is the weakest so far with almost no action—a few scenes of story and a big dose of soap opera.Episode Seven, Look at Yourself, takes a different tack as we open at an undersea drilling project and get involved in the story of Bill, troubled with difficulties in maintaining a relationship with his wife when he is so long away from home. Working at the bottom of the ocean in a boomer suit, he's thinking about having discovered his wife's affair and remembers the reflection of a man in the room on her watchband when suddenly there are electrical charges and his suit jets toward the surface.Reports are received that a rogue boomer is wandering the streets of Tokyo and it turns up at Bill's house, looking in at his wife and her lover. The A.D. Police are dispatched and stumble into the love nest but have trouble locating the boomer. Linna's suit has not yet been upgraded so Priss and Nene are send out after the rogue. The boomer turns out to have been a superpowerful boomer designed for undersea operations, capable of resisting immense pressures and quickly turns out to be too much for the police to handle. As the two Knight Sabers head out, Maki realizes that Nigel had not quite finished with the modifications of the suits and hurries to find the mechanic and get his help in dealing with the boomer.Fireball opens with Priss being interviewed and then we see her singing onstage, alternating with shots of her out on the road on her motorcycle. She stops by to visit Nigel and Maki who are at work on a new type of motorcycle. It becomes obvious that Nigel and Priss have a "thing" that is undefined. Later Priss has a run in with the A.D. Police; Leon tries to pick her up and runs full blast into Priss' hatred of authority.The episode seems to be wallowing in the same pseudo soap opera mode that dominates this disc, when suddenly the A.D. Police send out an alert that a "mad boomer that's fused with a racer is tearing up the quadrant." This definitely leads to the best boomer battle in the series yet. With the high speed of the boomer, Nene and Linna are unable to bring it down. Priss had been singing on stage and quickly goes to Nigel's shop to pick up the motorcycle he has been developing with the same principles as the hard suit and zooms off in pursuit of the speeding boomer.The end of Fireball almost, but not quite, makes up for the lack of action and the heavy doses of silliness in this episodes. Although there are some moments of stylized action and suspense, this disc is not quite as good as the first in the series. The character of Maki is not necessarily the best move for the story, although this may change in future episodes. So much is being hinted at that it seems that we are set up for a lot more to happen in the future. Image Transfer Review: The transfer is quite good for this round of Bubblegum Crisis Tokyo 2040. Rich colors and detail enhance the stylized animation style and I noticed very few flaws in the presentation. The overall balance in black levels and contrast make this excellent eye candy. Audio Transfer Review: The original Japanese stereo, with English and Spanish stereo dubs are provided. As with previous discs in the series, these are well-delivered with good use of ambience and the show's underlying hard rock score. This is my second disc in the series and that theme song is totally addicting. Extras Review: The profiles of the male characters in the story are the only thing in the way of extras for this disc. Although they do provide some needed information about the characters, once again, some one interested in the series might do well to visit the ADV Films web site or one of the fan sites on the Web. Four more pieces of Bubblegum Crisis Tokyo 2040 and unfortunately the action is pretty sparse. Although a certain amount of exposition is necessary, here we have overly large doses and the stories seem to drag a little, before ending abruptly. Definitely not as good as the first disc.